Home City Wise Why Didn’t Cincinnati Become America’s “Motor City”? Why Didn’t Cincinnati Become America’s “Motor City”? The makes are all but forgotten now: CinO, Armleder, Buggycar, Crane & Breed. These, and a dozen companies, manufactured automobiles in Cincinnati. From around 1900 to 1920, Cincinnati streets rattled with the clatter of home-grown flivvers. Then World War I and Henry Ford squelched the Queen City’s shot at becoming America’s Motor City. As the idea of mechanical buggies gained traction, Cincinnati’s carriage makers experimented with every available means of propulsion – steam, electricity and internal combustion – to replace horses. While the carriage makers dreamed up passenger vehicles, local wagon makers aimed more toward truck-like vehicles. Crane & Breed, for example, manufactured coffins and horse-drawn hearses for more than 50 years before attempting the first American automobile hearse in 1906. Emerson & Fischer had a long run turning out buggies, surreys and road wagons before they produced the first Cincinnati-made automobile in 1896. Some of Cincinnati’s biggest names jumped into the automobile market, with little success. For instance, in 1901, you could have purchased your very own Shillito. Yes, the department store folks manufactured a steam-powered auto. At around the same time, the Lunkenheimer company produced two prototype vehicles for a planned expansion from their well-known valves into transportation. They had second thoughts and never went into production. Out on West Eighth Street, the Anchor Buggy Company turned out vehicles with enclosed cabs, something of an innovation at a time when most autos were open-air contraptions just like the carriages they were based on. This was the only selling point for this short-lived car. Although most online automobile histories claim Anchors were manufactured only 1910-11, an Anchor advertisement appears in the 18 December 1916 Cincinnati Post. Out on the Little Miami River just north of Lunken Airport is the Otto Armleder Memorial Park, a monument to the continuing generosity of a pioneer Cincinnati automotive leader. Mr. Armleder was a wainwright – he made wagons – and began adding gasoline-powered engines to his hauling carts around 1912. The Armleder factory occupied an entire block at the southwest corner of Twelfth and Plum. It appears Otto got out of the truck-making business around 1922 and sold the business to a competitor soon before he died in 1935. From 1907-1909, the Buggycar Company produced a two-passenger “piano-box” runabout featuring a 14 horsepower, two-cylinder engine and “no complicated parts.” It was advertised as “The simplest car of the high wheeled type now on the market.” The factory was in the West End at the southwest corner of John and Armory. 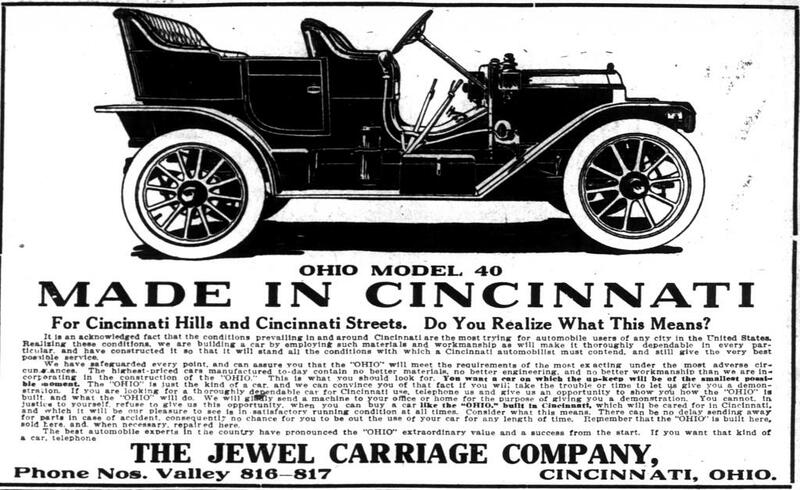 The Jewel Carriage Company begat the Ohio Motor Car Company which begat Crescent Motors, all at a factory in Carthage. By the time Crescent’s Ralph Northway took over, the company marketed three lines: OhiO, Crescent and Royal. The OhiO vehicles putted along with 30- to 40-horsepower engines, while the mid-range Crescents boasted 50- to 80-horsepower six-cylinder engines and the deluxe Royal hauled seven passengers with its 80-horsepower six. Just as sales started taking off, Crescent relocated to St. Louis, where the standard model became known as the Superior. Made in Cincinnati, made for Cincinnati, that was the Enger automobile. Advertisements boasted about the Enger’s capabilities on Cincinnati’s terrain: “Our home is here. We know what Cincinnati’s hills require in an Automobile. We know what kind of car the rough roads hereabouts demand. Such a car we have built in the ‘Enger 40.’ The sales pitch held up for almost eight years, from 1909 into 1917. Longtime carriage makers Haberer & Company, introduced the CinO (Cincinnati, Ohio – get it?) in 1910. The 40-horsepower five-seater rolled off the production line out in the West End near Gest and Evans streets. 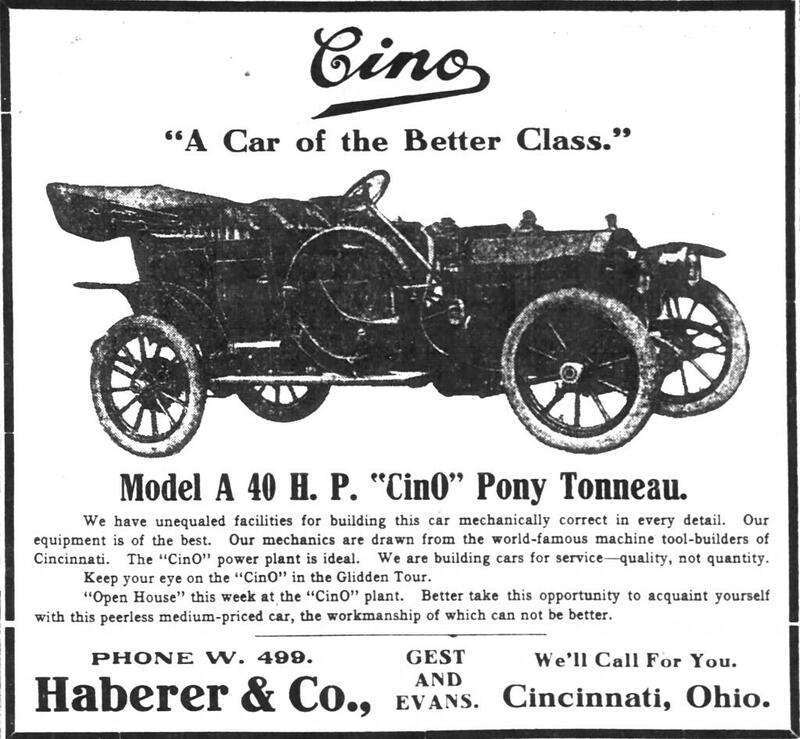 Like the Enger, the CinO must have been road-tested on Cincinnati’s famous hills. The Glidden endurance race of 1910 pushed the CinO to its limits, but it prevailed. Of 14 vehicles that departed Cincinnati, only six completed a road trip to Chicago, the “longest and most hazardous tour in history” and one of them was a Haberer CinO. However, CinO was more famous for its employee baseball team, a powerhouse in the city’s amateur leagues over many years, even after Haberer stopped manufacturing complete vehicles and switched to automobile parts. William and Gustav Schacht manufactured automobiles, commercial trucks and fire trucks from 1902 to 1940. William favored automobiles and oversaw production from 1902 to 1914 with only 8,000 vehicles assembled over 12 years. Brother Gus preferred trucks, and prevailed. Advertising themselves as “Manufacturers of Wire Wheel Vehicles, Carriage Materials and Machine Specialties,” the Schact factory was out on Spring Grove Avenue. Renamed the G.A. Schacht Motor Truck Company, the firm produced fire trucks until 1940. The Special Motorcar Company had a small factory at 640 Main Street, rolling out automobiles under the Queen City Special motor vehicle line. CEO E.C. Schumard is described in a 1903 advertisement as “thoroughly practical and no mere inventive dreamer.” Even though their own eight-horsepower, two-cylinder cars were advertised as “the best proposition in America,” Special held the southwest Ohio franchise for Searchmont autos from Philadelphia. Schumard later abandoned passenger cars for truck design. In the free-for-all days of the early 1900s, Cincinnati had a lot of competition as an automotive center. Detroit had competition, too. Indiana in general and Indianapolis in particular almost claimed the crown. (Ever wonder why the Indy 500 is in Indianapolis?) Eventually, Detroit’s innovative ideas, better access to raw materials and bloodthirsty entrepreneurship won out, and Cincinnati’s automobiles retired into the realm of collectors and historians.